We had our first encounter with an Australian Border Force boat in Darwin. They came out to Red Dragonfly one morning and asked us a few questions. The uniformed officers were friendly and polite. We aren’t sure exactly what information they were looking for, but once we explained that we’d just arrived and would be heading to Timor-Leste in a few days, they seemed satisfied. After confirming that we knew how and where to check-out of Australia (at Customs House), they left us to it. Prior to this, we’d heard stories from a few sailors about the border force planes that patrol the Australian east coast. They fly up and down, watching for any discrepancies with eagle eyes. Several of our friends had been contacted by the planes on their VHF radios. Apparently, they are typically pleasant and just ask a few questions like how many people are on board, and what your last and next port of calls are – similar to the questions we were asked in Darwin. It was a surprise as we’d both just been up on deck and hadn’t seen it, and it didn’t show up on the radar. But there it was. I should clarify here that when we say ‘right in front of us’ on a boat/in the ocean, what we mean is that it could be half-an-hour to an hour away still. We are only moving at 5-7 knots after all. We watched carefully through the binoculars trying to work out if it was indeed a fishing boat or perhaps a boat with refugees. We wondered which country it might be from. We needed to work out which direction the boat was going and whether or not it was trawling a big fishing net out the back so we could make a decision about our course. It was one of those wooden fishing trawlers that are commonly found throughout Asia. Those boats that are probably really strong and reliable, but with the rust stains running down the sides and the flaking paint, they also look like they may not make it to their next destination. The photo below is of a few of these boats rafted up together and anchored just near us in Dili harbour. Eventually we identified an Indonesian flag flapping in the breeze off the back. Ah huh! More information, that’s good. At least if we need to radio them (if they even have a radio) then I can communicate with them in Indonesian. As we got closer we started to wonder if the boat was actually moving at all, and as we sailed past we confirmed that it was indeed stationary, just bobbing in the middle of the ocean. We guess it must’ve had an anchor out keeping it steady, although we couldn’t see one. It was a very strange site seeing a boat anchored in the middle of the ocean, with no land in site, and with no clear purpose. We spent a good chunk of time sharing the binoculars around and coming up with theories as to what on earth this boat was doing out here. We couldn’t see anyone up on deck and wondered if it might be a boat that fished at night. This would explain why we couldn’t see any crew as they were perhaps all asleep during the day. There are a few shoals and shallow patches in the ocean between Darwin and Timor, so we guess it would be fishing in one of those spots. This seems the most logical explanation as the rest of the ocean in that area has depths between 100m and 1km. Sailing past our first Indonesian fishing vessel was a good reminder for us to be vigilant with our regular horizon scans at all times of day and night. 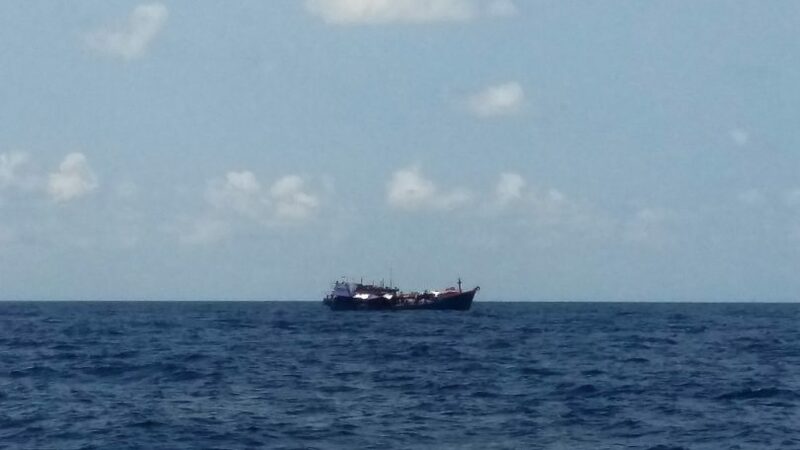 This boat, like many local fishing boats in Southeast Asia, had no AIS (Automatic Identification System) and wasn’t transmitting any signals so our fancy modern tech gear didn’t pick it up. If we had the radar on, it probably would’ve come up, but we only use the radar at night. It was approximately 10 minutes after we passed the fishing boat, once we were all settled back into our activities, when I saw a plane in the distance flying quite low. I pointed it out to Simon who was sure it would be a Border Force plane, and he was right. The plane was flying from the north and flew right over us and towards the fishing boat. We thought they’d be particularly interested in the boat given that, according to our charts, it was anchored right up near the edge of Australia’s fishing maritime border – although technically on the outside of the protected area. We weren’t sure if it was possibly fishing illegally, but it would certainly help make this story more dramatic if it was. We watched in anticipation, wondering if we might be about to become first-hand witnesses to a show of force by Australia claiming their national sovereignty in these waters. Unfortunately, there is no Hollywood-worthy ending to this story. As we monitored the planes movements we turned our radio up in case they tried to contact us. They didn’t. The plane flew over the fishing boat, circled around and flew back over the top of us. It then turned around again and came back over us a third time and flew very low over the fishing boat before making a sharp right and continuing on its way. We were both relieved and a little disappointed that they didn’t radio us. Not even a wave or a little dip of the wing to acknowledge our presence. So that was it. A few loops around and they were off! Our close-ish encounter with one of the planes that monitors Australia’s maritime border. It was certainly the most exciting thing that happened that day, and in fact during the whole trip across the ocean between Australia and Timor-Leste. Well, that and the pod of dolphins who visited us for about half an hour later that same afternoon. We arrived in Dili as the sun was rising on Tuesday 7th November after a smooth 3-day/3-night sail in calm weather. 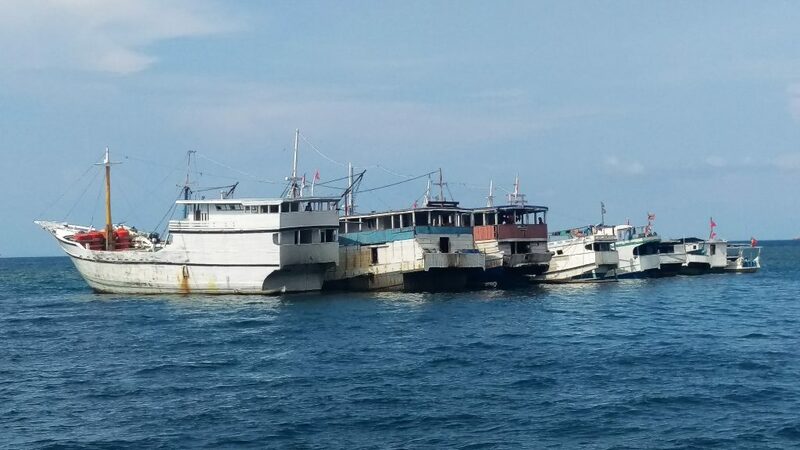 A few days later, Simon was online and saw an article in the Northern Territory news about three Indonesian fishing vessels apprehended in the Timor Sea, inside the Australian Exclusive Economic Zone. Is one of those boats the one we carefully scrutinized through our binoculars a few days earlier? We’ll probably never know – but it turns out there was indeed some drama on those high seas – we were just a little too early to witness it.